In the end, the centerpiece of our Burns night party was not haggis, but steak pie: rich beef and vegetable stew baked in a pastry crust. I'm not a big pot pie person, but Mark has fond memories of steak pie and chips at the neighborhood pub in when his family lived in Scotland. Who am I to argue with nostalgia, on a night dedicated to indulging in nostalgia? This was a good one, as far as pot pies go. The stew was hearty and rich, with earthy vegetables and tender beef bobbing in an onion-and-ale-infused gravy. The crust was flaky and shot through with the unmistakable flavor of butter and lard. All good things. But for me? Maybe too much of a good thing. The pastry was so rich and distracting, it kind of overpowered the subtle flavors in the stew itself. We all enjoyed it (that pie was demolished, lest you think we all pushed it around with our forks or something) but as Mark and I agreed the next morning, we've probably filled our pot pie quota for, oh, 3 years at least. However, as you can tell from my description above, I really liked the stew and would totally make it again. Sometimes beef stew can be stodgy, but this one -- with the sweet, golden rutabaga and carrot slipping into every other bite-- felt lighter than most. A long cooking in a low oven left the beef tender and the onion-and-ale infused gravy was at once sweet, savory and pleasantly bitter. (Not too bitter, just enough that you know the ale is there.) To serve, I'd swap pastry for crusty bread or a bed of mashed rutabaga. Or maybe egg noodles. If you are a pastry lover, I recommend just a top crust. 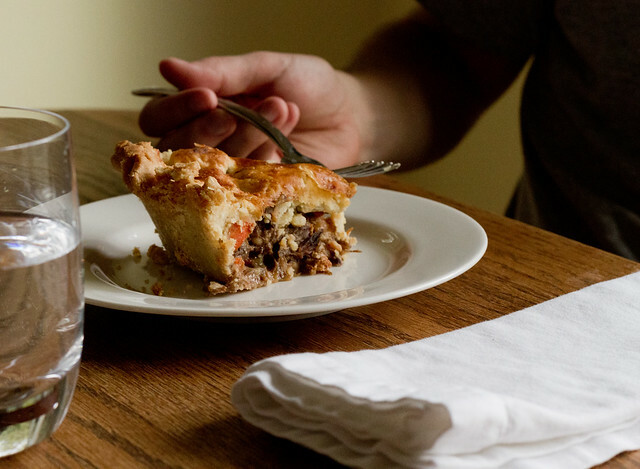 Or, follow Mark's mom's lead; she tops steak pie with a small round of puff pastry. This stew isn't at all hard to make, though it does take some time to build all the flavors. The most important thing here is to use well-marbled stew beef, like chuck. It's up to you whether you brown the beef: it's not entirely necessary, but I did it here because I like the deep brown color that the fond adds to the braising liquid. Feel free to think of this recipe as a rough guide: I used rutabaga, carrots, and chicken broth because that's what I had on hand. Beef broth would be fine, some other combination of root vegetables, different aromatics. The only caution I have is to watch the amount of ale you use; too much and the stew will taste bitter. Finally, I'm not sure why, but stews taste significantly better after resting in the fridge, so make this a day or two ahead if you can. I noticed that the stew had much more gravy on day 1 than on day 2, so perhaps the meat and vegetables absorbed more liquid/flavor overnight. Heat a large enameled cast iron French oven with lid over medium heat. When hot, add the oil and heat until hot and shimmering. Add half the meat to the casserole, without crowding, and brown both sides well. This creates lots of flavor (you'll see a fond begin to build up on the bottom of the pan) so don't rush the process, and don't crowd the meat or it will begin to steam instead of brown. When nicely browned, transfer meat to a bowl (leaving as much oil as possible) and repeat with the remaining meat. Preheat the oven to 275F. Now, add the chopped onion to the French oven and cook over medium-high heat. Use a wooden spoon to scrape the fond on the bottom of the pan and continue cooking until onion is nicely browned. Lower the heat to medium and sprinkle the flour into the pan and cook. Stir continuously for 2 minutes to remove any flour taste. Stir in the ale, chicken stock, bay leaves, thyme and beef and bring everything to a simmer. Season the gravy to taste. I added 1 teaspoon salt and a dash of soy sauce at this point, though the amount you need will depend on whether you used a salted chicken stock or not. Cover and set in the oven to cook. Check after 1 1/2 hours. My beef wasn't quite tender at this point, and I had to let it cook for another hour to get to the texture I wanted. I like the beef to be very tender, but it should keep its shape instead of completely collapsing or becoming stringy. When the beef is tender, adjust the seasoning with extra salt, if needed, and add the chunks of root vegetable. Return to the oven for 45-60 minutes, until tender but not mushy. Note: if you want to bake this in pie form, I recommend just a top crust. Cool the stew (as in, put in the refrigerator). Roll out a savory crust recipe (we used this one, minus the sugar; it is delicious and flaky, but hard to work with). Add stew to a pie dish, without overfilling, and press the top crust on. Brush the top crust with an egg wash and bake in an oven at 425F for 45 minutes, until crust is nicely browned and filling is 180F or so. This looks exactly like the stew my mother has been making forever, but we use guinness and add potatoes instead of rutabaga. We eat it with bread and butter and tt freezes VERY well! Aww, you noticed and cared! This is the nicest post ever. Yes, I deleted it by mistake, but now it's back on the left hand side of the page. Does this have another name? Seems like we had it in a pub with Mark when we were all in Scotland together way back when. Guinness pie, maybe? Also, is bubble and squeak something different? Hi Lauren - Mark always calls it steak pie. Steak and Guinness pie is definitely a thing. And bubble and squeak is, I believe, a crispy hash of leftover cooked vegetables like potatoes/cabbage/brussels.